There is a growing emphasis, in Education Regulations, on the responsibilities of the classroom teacher to do whatever it takes to support every child in their classroom with every need they bring to school. This is a tall order and the mere suggestion of adjustments for everyone has sent some teachers running for the exit. But, it isn’t as scary as all that. We need to be realistic and reasonable in our application of regulations. Often the adjustments, modifications and supports that yield the most benefit occur during our planning process. Many teachers cringe when they hear the word “differentiation” and many simply don’t understand the educational meaning of the word. I’m not even going to try and define it so if that’s what you were looking for, check out another edublog. I’m going to tell you that Assessment (and even classroom activity) modification is a process that can be much easier than you think. There are many different ways of modifying or adjusting assessment. Some are quick and easy for the teacher; but rarely suitable for most students. Some modifications are extreme and there is no hiding the fact that what is handed to the ‘special’ kid is a completely different task. The best kind of modifications are small, and at times almost invisible. I could get into the arguments and issues around what is and isn’t “differentiation” but that isn’t the point today. Instead, let’s look at a few things that you can consider, when you are creating or reviewing the next assessment tasks for your students. 1. Read the task (and any supporting material) and the criteria with a perspective of comparison. This is a n important step and unfortunately my heading above might be difficult to understand. Basically, ask yourself: “what is really being assessed here?”. then compare that with the task. Often, teachers set essay questions or slide presentations as assessment tasks when we want a student to explain content or connect separate concepts that have been learned during the unit of study. Adjustment to assessment is about thinking outside the box. If the student struggles to write sentences clearly, but can clearly explain the content verbally, why would you fail them because they struggle with the writing. If the criteria assesses text structure, that’s a different conversation, but if the criteria can be met using other modes of communication, allow that to happen. An essay could be presented using a flow chart, story board or advanced organiser. A slide presentation could be a poster, matching activity or table. Remember the key questions: What is being assessed? then What is necessary to meet the criteria? 2. Provide models and structures for students to follow as they answer or respond to stimulus. Whether you do this as part of revision activities, preparation tasks or in the layout of a test, it is a method which can be supportive for many student difficulties. Providing examples and using simplified language is recommended for EAL/D (speakers of more than one language), ASD and SLI students, to name a few. Even the most confident and educated adult prefers to see others do something before they have to do it for the first time and likes to have some sort of direction/ boundary that makes the expectations clear. Asking students to complete a table is an easy way to provide structure and examples of accuracy. Providing a sentence frame can also be an easy way to reduce the literacy demands of a task and ensure the students are focusing their energy on restating knowledge or higher level thinking processes instead of their sentence structure. Of course if you are assessing sentence structure, then other adjustments might need to be made. 3. Reduce the number of tasks OR Break it into manageable chunks. One of my colleagues would tear the test booklets into single pages and only present one page to the class at a time. For example: on Monday she would say, ” today we will be completing page one of the maths exam.” Students would see 5 questions and confidently tackle each question, knowing they can complete the page in time. If students finished with time to spare she would allow for a short ‘break’ then give the students the option to begin the second page or wait until the next day. We often feel too rushed to allow extra time when it is needed. 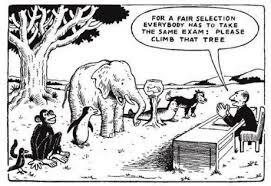 However, I believe that by adopting this more reasonable approach we see more students attempting every question and experiencing less anxiety around exam time. 4. Provide extra time and Allow for short rest breaks. While I understand that time restraints are a part of life and it is vitally important that we know an assessment task is completed by the student (and not their parent or sibling), we need to be reasonable about the amount of time students have to complete a task. If you expect a student with literacy difficulties to read stimulus material and then apply background knowledge to a written response, is it really fair to only give them the same amount of time that a student reading (and writing) above grade level is given. 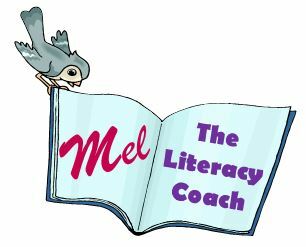 I know that struggling readers and writers often don’t use the time provided as they tend to give up – but this is often related to the time restrictions and their belief that they will never be able to read all the material in the allocated time. This point also supports the next adjustment idea. Assistive technologies might include an alpha-smart (text only typing device), speech-to-text recorders, text-to-speech recorders, ipads/ tablet devices and even calculators. The point about ensuring technology doesn’t hinder the student is perhaps more relevant when the technology can provide a distraction or confuse the student even more. I recently assisted learning support students in a Science class with a research assignment. The teacher in the classroom taught the students how to use the Tool in Microsoft Word that inserts references and creates a bibliography at the end of a report/ written text – this was very helpful! She also encouraged students to use the internet to research their chosen topics- not so helpful! Unfortunately, many of the students had little basic understanding of the topic they had selected. They didn’t have the necessary research skills to find relevant information online. They didn’t know who could have been a primary school blogger or a university professor when it came to blog authors. Much of the ‘research’ was time consuming and irrelevant, causing students to either: collect inaccurate information, or completely disengage. Using Google came with the lure of other websites, advertising and games that only served to distract already struggling students. Needless to say, results were chaotic and disappointing. Technology is only useful in assessment if it saves time and allows students to focus on the skills being assessed. Five simple steps are rarely as simple as all that. The next time you are creating or modifying an assessment task, don’t feel overwhelmed, consider implementing at least one of these steps. When you feel that you have that step mastered, choose another one. Obviously, some of the steps above will be easier than others and some steps are not always appropriate for the situation. Either way, you will have to ‘like’ this post or ‘pin it’ or add it to your bookmarks, so you can come back and remember how to adjust your assessment tasks to suit the various needs in your classroom. These things are not just for assessments either; you can apply them to everyday classroom activities as well. What resources are available to you when it comes to supporting special needs of students in your class? How do you use these resources? How do you adjust classroom activities and assessment tasks to suit your class? What is your number one tip for adjusting materials and assessments? Something to say? Feel Free to Comment and Share. You know how much I love anchor charts and posters. 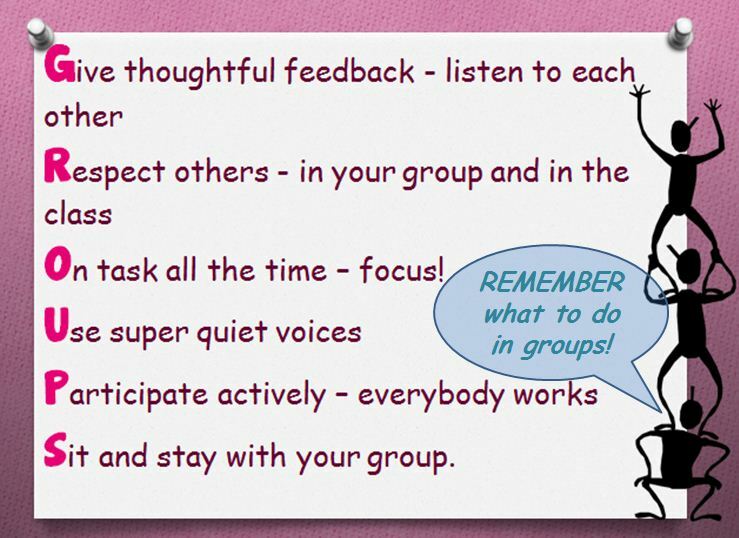 I found this gem on Pinterest and used the format for creating a Group work behaviour prompt for my classroom. Lots of teachers use this acronym in their classroom to teach the routine behaviours they expect to see every student displaying when they are working with a group. The poster/ slide of the acronym becomes a prompt that the teacher refers to every time the class prepares to do group work in the classroom. I shared this GROUPS acronym with a few of my colleagues recently and linked it to Design Question 2 in the ASoT framework (although the group work strategy fits into all design questions). My head of department liked it so much she asked me to share it with all the teaching staff at my school. The feedback I received from the most unlikely sources – teachers who, I know, avoid group work simply because it is difficult to get the kids on task- truly surprised me. It was encouraging for me to see my colleagues excited about a teaching strategy; it’s a simple strategy that works! Adapted Groups Acronym. Prompt group work expectations! The beauty of this acronym is that you can adapt it to suit your students and your classroom context. You can see from my slide that I changed it for my class. I wanted it to be more explicit about listening and being quiet. This certainly isn’t a new resource and I want to acknowledge the bloggers and teachers who shared it first. Check out these original posts. – use this resource and tell me how it goes. -adapt this resource for your classroom, tell me how and why.